Circular rotary replacement pinking blade designed to place "teeth" on the edge of fabric to reduce raveling and for creating a unique edge. Great for use with Polar Fleece. Stainless steel blade for sharpness and durability. 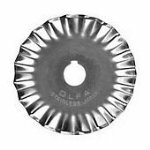 Fits Olfa's Deluxe 45mm Rotary Cutter RTY2DX and Pinking Cutter PIK2. 1 blade per pack.